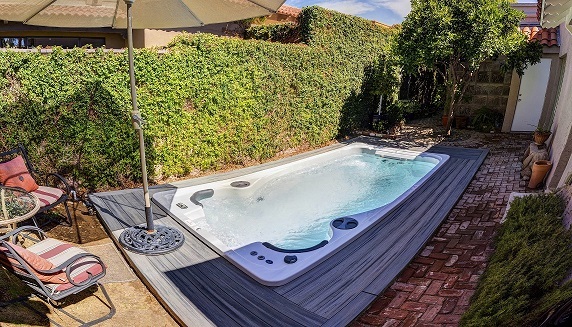 Therapy pools, such as this stand up jetted hot spa, are relatively small in size and volume of water. Throughout the history of mankind, bathing in therapeutic waters has been a cultural phenomenon. People would journey large distances to bath in hot springs, cold wells and mineral baths for their reputed health benefits. From ancient Roman bathhouses and natural hot springs to the European therapeutic hot and cold spas of the 1800s and Native American ceremonial sweat lodges, therapeutic bathing has been consistently popular with people from all walks of life. While the medical benefits of hot and cold spas and steam baths have been widely debated over the years, there is no denying it simply feels great to spend time in a hot tub or sauna. It is even better if a soak or steam bath can be followed with a plunge in a chill pool. Constructors of aquatic environments have the luxury of building pools and spas that closely regulate the temperature of the body of water. In modern times, the natural environment does not limit designers and builders; they have several options to help clients enjoy the benefits of hot- and cold-water therapy. The main use of a body of water typically determines its water temperature. While the figures below offer a general use guideline, they are debatable and will vary from facility to facility. Hot tubs: 38 to 40 C (101 to 104 F) (spas are generally regulated not to exceed 40 C; in some jurisdictions limited to 39 C [102 F]). This article will focus on the two temperature extremes among the aforementioned pool options: therapy and chill pools. Therapy pools are often shallow and may contain a movable floor; the water temperature is often elevated to a very comfortable 31 C (88 F). A common theme in therapy pools is to eliminate the use of traditional chlorine. Salt water, mineral water or combinations of UV and ozone are used to condition the water. Advanced therapy pools incorporate massage jets, movable floors, acrylic viewing panels, natural water chemistry and stable, but relatively high water and room temperatures. Massage jets are also often part of the system. Commercial therapy pools constructed of fibreglass or stainless steel are a viable option where budget, weight or time constraints would limit the construction of a traditional concrete vessel. One-piece commercial units will still require some significant site preparation, however. For instance, an access path to the pool site large enough to accommodate the pool shell, as well as a mechanical pit, utilities, grounding device, sump pit, water supply (equipped with an anti-siphon device) and sanitary discharge will need to be provided based on the engineered requirements of the specific site. Architectural, mechanical, structural, electrical and plumbing guidelines must also be followed to meet local building codes. Furthermore, as therapy room temperatures for athletes and patients are typically kept at 28 to 30 C (84 to 86 F), the pool room will require a dehumidification system. Therapy pools are relatively small in size and volume of water. Smaller vessels can be equipped with underwater treadmills to provide a cardiovascular workout under controlled environmental and limited weight bearing conditions. The depth of the water can often be changed in a therapy pool to accommodate different body types as well as the therapy needs of the individual client. Movable floors can be as simple as a small ramp that changes elevation, to an entire floor of a large commercial pool changing grade, which allows the pool to be used for various therapy needs. A therapy pool, like any other swimming pool, is a non-weight-bearing environment. Water-based exercise is a low-impact activity that improves stability, endurance and range of motion. Water is a very safe environment for rehabilitation, as its buoyancy helps take the pressure off of joints (e.g. injured knees, ankles and hips), while the warmth of the water helps move fluids through the lymph system as users walk or exercise allowing for a faster recovery. Aerobic capacity, balance, flexibility, strength, respiration, wellness and fitness all benefit from the proper use of a therapy pool. These pools are commonly used by athletes, as well as individuals who have undergone surgery, suffered an injury or have chronic pain. The decrease of gravity in water also allows users to remove as much stress as possible from injured joints and tissues. The warm water allows the athlete to relax their muscles and speeds the healing of damaged tissues, while the user stays fit and healthy. Therapy pools are even used with animals, such as dogs and horses. Weight bearing is controlled with life jackets, raising the floor level or lowering the pool’s water level to a comfortable height.